Our popular cotton muslin favor bag is reinvented with an all new look! These sweet baby shower personalized silhouette bags are bold and bright and are the perfect favor bag option for a baby shower, birthday party and more. Made from heavy unbleached cotton, the eco-friendly favor bag can be personalized with your choice of background color and design silhouette. 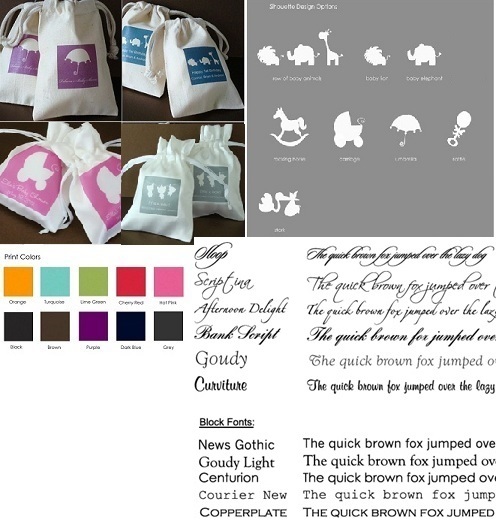 Add your personalized text, choose your font and you have favor bag that is uniquely yours!! Our popular satin favor bag is reinvented with an all new look! These sweet baby theme silhouette bags are bold and bright and are the perfect favor bag option for a baby shower, birthday party and more. Made from silky white satin, this favor bag can be personalized with your choice of adorable designs and fonts. Design will be printed in the center of the bag with text printed underneath. We can accommodate approximately 20 characters per line, 2 lines of text maximum. Muslin bags have no bag color choice, but satin bags do.